I absolutely love felt projects because there are so many possibilities, and it is so, so, so easy to work with! This felt star was actually a gift for our second daughter on her third birthday, but we just recently came across it again (hence the crooked bow!). Our four-year-old was so excited to find it that I had to share this project as a fun stocking stuffer for the little ones in your life. With a machine or by hand, sew the smaller star onto one of the larger stars. Then sew both stars together, leaving a small opening at the bottom to stuff it and insert the dowel. 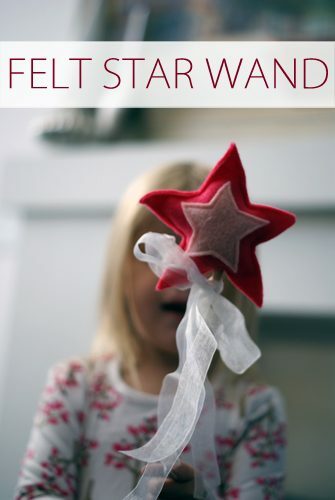 Fill the star with the polyfill and then put a little bit of glue on the dowel and insert it into the star. Tie a ribbon at the bottom of the star, and you’re done! Make star bean bags: Fill with rice or dried beans instead of polyfill, add ribbon to the opening and sew closed.